Temple, as it appears as a Past Stage in Brawl. Past Stages is one of multiple designations given to stages returning from previous installments in the Super Smash Bros. series. 1.1 From Super Smash Bros. 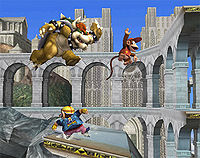 In Melee, three Past Stages were available. They are replicas of their Super Smash Bros. counterparts, complete with music and backgrounds. All of these stages must be unlocked, unlike in the original game. The stages also seem to be slightly larger in size than before. In Brawl, they are referred to as Melee Stages, as only stages originating from Melee reappear. This makes Brawl the only game where stages from the first Smash Bros. do not appear. These stages now utilize the functions of My Music, like most stages in Brawl. According to the DOJO! !, the stages are arranged so the player can get one from each game world. This turned out to mean each universe that was represented in the original game, all of which had multiple stages in Melee. Unlike the Past Stages of Melee, some Melee Stages have had minor edits (which are listed below), while aesthetically remaining largely the same as Melee. Big Blue Unlockable Floating platforms and other airborne items except bumpers don't fly away with the stage. Corneria Starter New sound effects for the flying Arwings and Wolfens, blasts from the Arwings and Wolfens no longer KO but still deal damage. Green Greens Unlockable Bomb blocks have much more knockback, making it able to KO at low damage percentages. All three block columns in each side must now fill to the top in order to halt the dropping blocks for that side, rather than just one. Jungle Japes Unlockable Characters can now swim in the river, but it will still carry them off-screen; Klaptraps have different properties. Pokémon Stadium Unlockable Fireworks in the background look different, the windmill's platforms in the water stage are no longer pass-through, new sound effect from Pokémon Stadium 2 can be heard when the stage is changing. Rainbow Cruise Starter Floating items like Party Balls no longer fly offscreen, characters can no longer jump through the donut lifts. Temple Starter Edge near lowest platform can no longer be grabbed. Onett Starter Warning sign when a car is approaching is much smaller and can hardly be seen, right edge of the roof on the building on the left can not be grabbed, hospital in the background has had its red cross removed, the blue house's roof has a small area on the sides where players cannot jump over, cars are much weaker though they can still damage the player. Yoshi's Island Starter Reduced size. It should also be noted that most (if not all) of these stages are smaller compared to the characters than they were in Melee, possibly due to the character models being larger in order to provide more detail. Also, some of the music sounds slightly different than it did in Melee. Finally, the Pokémon Trainer gains platforms in the background. Known as Familiar Stages this time around, the selection of returning stages in Super Smash Bros. 4 differs depending on the version. This is the first time that returning stages aren't solely from the directly-preceding game, although the selection is still primarily made up of Brawl stages, with all Melee-originating stages having also made Brawl appearances. Unlike in previous games, returning stages appear in both the Wii U and 3DS versions of Classic Mode, as some of them are the only stages representing their respective universes. Like Melee and unlike Brawl, these stages appear with normal stages, rather than on a separate page. However, unlike Melee, which gave the stages their own section at the bottom, these stages are merged right in with the normal stages, possibly because there are so many. Like Temple, some of the textures on the 64 stages are touched up slightly, but in general most of the original look is retained. Also, the Super Smash Bros. stages have '(64)' at the end of the title. Nearly every stage from previous games make their return in Ultimate. This time around, stages from every game preceding it make their appearance, from the original Super Smash Bros. to Super Smash Bros. 4. All past stages, most noticeably those from Melee and 3DS and Bridge of Eldin from Brawl, receive a visual update, though stages from the first game retain their primitive polygonal aesthetic, likely due to nostalgia reasons. Every stage also comes with a Battlefield and Ω form. The only playable stages to not return are Planet Zebes, Sector Z, Mushroom Kingdom (SSBM), Poké Floats, Mute City (SSBM), Icicle Mountain, Flat Zone, the 1-2 variant of Mushroomy Kingdom, Rumble Falls, Flat Zone 2, Pictochat, Rainbow Road, Pac-Maze, Jungle Hijinx, Pyrosphere, Woolly World, Orbital Gate Assault, Miiverse, and previous variants of Battlefield and Final Destination. Additionally, none of the single-player-only stages from past games are present either. This page was last edited on February 8, 2019, at 09:14.